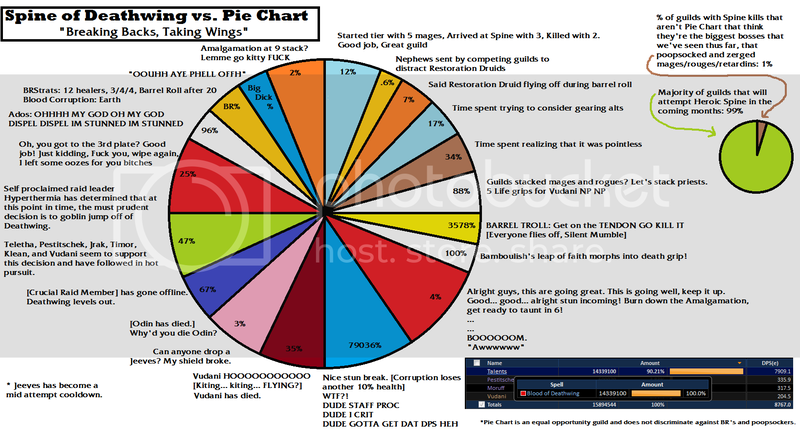 Pie Chart Guild • View topic - Heroic: Spine of Deathwing Down! 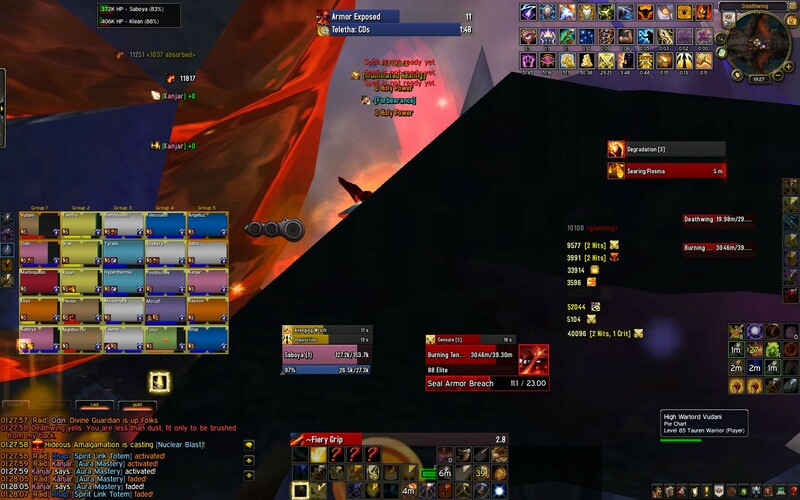 Home » Board index ‹ Public ‹ News & Announcements ‹ Heroic: Spine of Deathwing Down! Classic Pie Chart fashion: Last attempt of the night, last attempt of the lockout. I don't know where to start. I suppose the first thing would be a massive congratulations to our raid team. I'd like to thank those who were in and out for the kill. I haven't bothered to do a count of the attempts we put in, because to me, it's largely irrelevant in the face of what we managed to do. 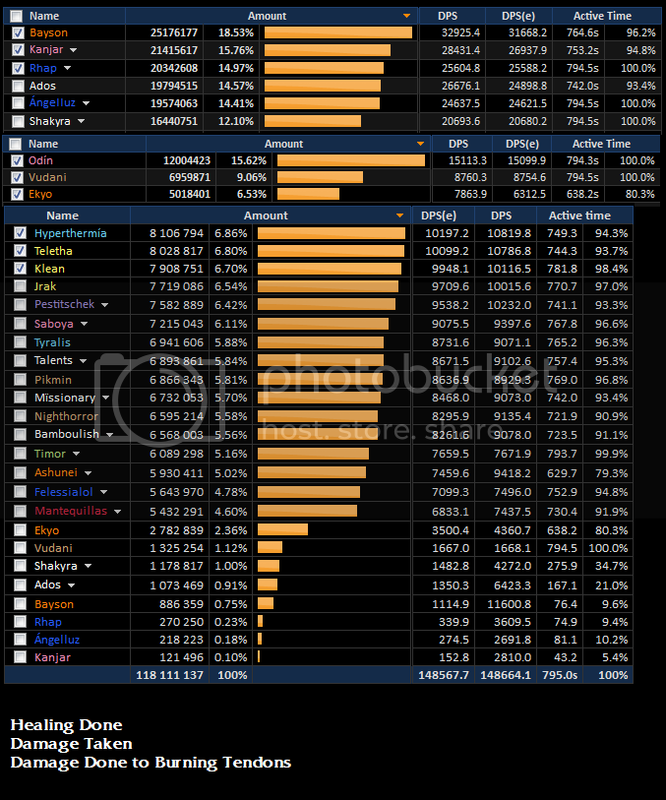 While guilds out there went and jumped through hoops to recruit mages, rogues, and retribution paladins, while guilds out there went and geared up specific class alts, we went in with what we had to work with and came out with we had in store. From day one we have emphasized the structure of our guild and its core mission and we managed to stay true to our essence, even through this encounter. For that, I'm very proud of our players and their persistence even when the decisions we made seemed slightly insane. Now, don't get me wrong. I'm not trying to diminish what other guilds have done, nor do I think what I have to say on the matter would matter much to them. Going through this fight, I had moments where I couldn't really see through the fog and expect that we would somehow summon the sheer numbers to chip away to the end of the third plate. But we did, only knowing that it had already been done. I really do think it's quite impressive that people encounter these fights and find ways to achieve the seemingly impossible. I tip my hat to Kin Raiders and Stars, both of whom found different ways to complete an encounter that has been tuned to be fairly grueling. But back to us. We've had our ups and downs throughout the tier and while we're still trying to close in on our personal goals, I am proud of what we accomplished with this encounter. We've managed a fairly early kill while staying true to our core values as a guild. We could have recruited bodies, brought in mercenaries, or even pursued a few choice alts, but ultimately we stuck with our roster and found a way to persevere. I think it's important to emphasize this because I feel that this encounter is only difficult because all the numbers have been merely overtuned in comparison to the normal mode counterparts. The fight itself doesn't change in any dynamic, significant way as most classic hard modes have in the past. Instead, you're forced to brute force your way through an encounter that remains fairly bland and only becomes exciting when you've managed to make your way consistently to the 12 minute mark or beyond, only to have your collective souls crushed a couple times. Granted, fights of this nature usually evoke nostalgia and while I'm sure I'll warm up to the memories that will represent Spine of Deathwing progression, it is disappointing that this will inevitably be the defining encounter of Dragon Soul. Regardless, the one thing that I am super thrilled about is that we were able to score this kill pre-nerf. Blizzard has had very inconsistent implementation with their nerfs, but given the placement of this tier and its proximity to the next expansion, I am pleased with their decision to wait out on the nerfs that certainly loom around the corner. With each fight and each tier, we as a guild, grow closer and closer to being the best guild we possibly can be while continuing to adhere to the foundations that have made us strong. Re: Heroic: Spine of Deathwing Down! Lovely snippet from DS progress. Plus, I find my part in the Pie Chart very dissapointing. I thought it was a great and timely front page update. Great job with the screenshot graphic too.